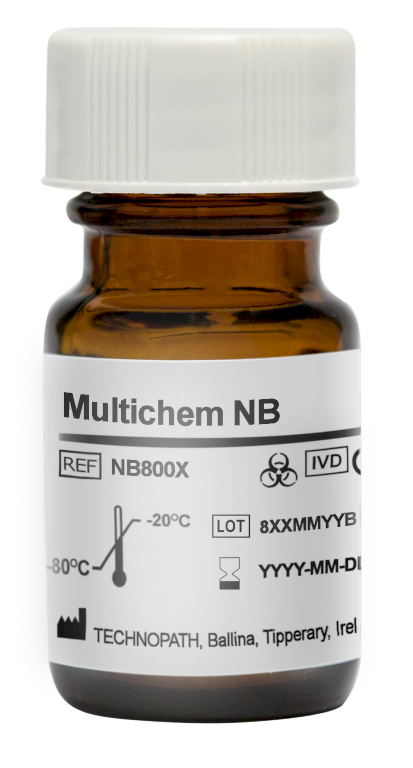 Multichem NB Control is intended for use as a third party, single level, liquid stable quality control material to monitor the precision of laboratory testing procedures for Bilirubin and Theophylline Assays. The intended patient population is Neonates, where a requirement has been identified for testing conditions associated with Neonatal hyperbilirubinemia. The product also contains Theophylline, a therapeutic drug that is given to Neonates to improve lung capacity and where it would be required to monitor for toxicity risk. Caffeine is a listed analyte that is added gravimetrically, and this has a clinical function as the primary treatment of the breathing disorders apnea of prematurity. The requirement for a high concentration of Bilirubin presents a conflict for consolidation of multi-analytes. This means that not only is a separate paediatric control required, but a control matrix that is treated with antioxidants to inhibit the oxidation of Bilirubin. The application of the most appropriate measures to reduce the effect of oxidation on the high levels of Bilirubin in the Control have been researched to ensure that open vial and closed stability is maintained. Multichem NB Control is designed as a single level, liquid stable frozen product. The product will typically be run as a supplementary high level control, in conjunction with at least one of the Multichem Serum Control levels, (S or S Plus) to provide a minimum of 2 levels of control to allow assay system performance monitoring within the analytical ranges. It will be run after reagent calibration and at a frequency dictated by laboratory QC procedures and reagent / instrument manufacturer instructions. The product should be treated the same as patient specimens and run in accordance with the instructions accompanying the instrument, kit or reagent being used. . The control is to be stored at -20°C to –80°C and thawed as per IFU prior to use. The product is to be stored at 2 to 8°C between use.